Published on May 16, 2009 in blogging, mobile and wordpress. 1 Comment Tags: blogging, mobile, wordpress. 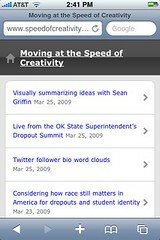 Since I received Nokia e51 I’ve been browsing web pages with Opera Mini. This is a decent browser which makes reading pages easier but it can’t do all. The best case is when not only the browser cares to display the page best it can, but also the owner of the page does so, i.e. only important content is downloaded so that the page is lighter and loads faster (which is important if you are not having a free WI-FI connection). Thus I’ve decided to adapt my blog for mobile devices. Because I’m using WordPress engine I looked for a plugin which can do this work for me. I’ve found a couple of plugins and I desided to install WordPress Mobile Pack. Now this blog looks on a mobile devices as a sample screen shot displayed above. P.S. Let me know if you use a different plugin. Maybe there’s something even better than WordPress Mobile Pack. Thanks in advance! I’ve just tried your blog on my mobile and unfortunately got the web version! The good news is that I’ve released a new version of the Wapple Architect Mobile Plugin for WordPress. It supports every device in the world, allows you to retain your URL and brand identity – every element on your mobile site is customizable! If you want to check it out, the homepage can be found here: http://wordpress.org/extend/plugins/wapple-architect/ – it’d be great to hear what you think about it! If you need any help installing or enhancing the plugin, get in touch over at http://mobilewebjunkie.com – i’ll do my best to give you a hand!